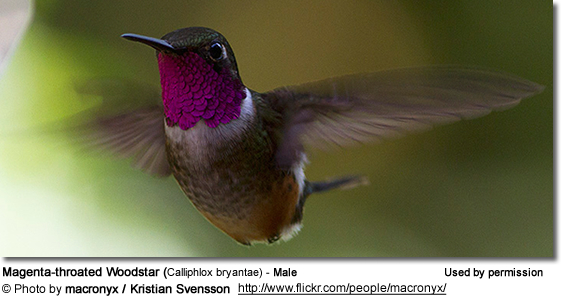 The Magenta-throated Woodstars (Calliphlox bryantae) - also known as Magena-throated Hummingbirds or Costa Rican Woodstars - are medium-sized, non-migratory (resident) hummingbirds that are found only in southern Central America. 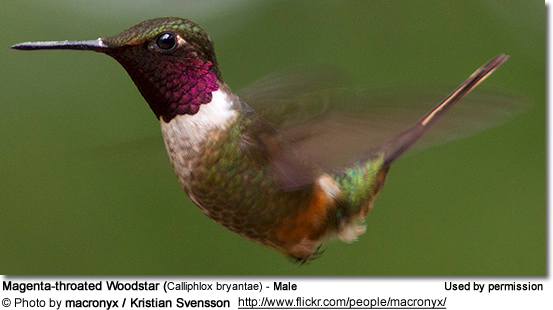 Magenta-throated Woodstars occur naturally along the forest edges and scrub in Costa Rica and western Panama. They are restricted to the Pacific slope of the isthmus, where they are found along forest edges and scrub, at elevations from 2,300 - 6,100 feet (~ 700 -1,850 meters). 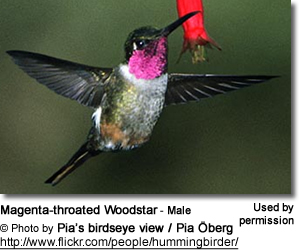 The Magenta-throated Woodstars measure about 9 cm long in length and weigh about 3.5 g.
The male has a distinctive magenta throat separated by a white collar from the green chest and flanks. The back is green and the belly is rufous. He has white rump patches. The black-tipped tail is long and forked. The female lacks the male’s long tail. Her plumage is generally like the male’s but her throat is grey-buff instead of magenta, and the tail sides are rufous. Juveniles resemble the female, but the plumage below is paler and they have buff fringes to the upper plumage. They resemble the Bahama Woodstar (Calliphlox evelynae), but occur in different geographical areas. The Magnificent-throated Hummingbirds primarily feed on nectar taken from a variety of brightly colored, scented small flowers of trees, herbs, shrubs and epiphytes. In winter, when flowering plants may not be readily available, they may substitute their nectar diet by drinking the sap from holes created by sapsuckers. They may also visit local hummingbird feeders to feed on sugar water. They drink out of bird baths or water fountains where they will either hover and sip water as it runs over the edge; or they will perch on the edge and drink, just like all the other birds; however, they only remain still for a short moment. They also feed on small spiders and insects - important sources of protein particularly needed during the breeding season to ensure the proper development of their young. Insects are often caught in flight (hawking); snatched off leaves or branches, or are taken from spider webs. A nesting female can capture up to 2,000 insects a day. Hummingbirds are solitary in all aspects of life other than breeding; and the male's only involvement in the reproductive process is the actual mating with the female. They neither live nor migrate in flocks; and there is no pair bond for this species. Males court females by flying in a u-shaped pattern in front of them - either alone or in competition with other males. He will separate from the female immediately after copulation. One male may mate with several females. In all likelihood, the female will also mate with several males. The males do not participate in choosing the nest location, building the nest or raising the chicks. The males' songs are described as spluttering gurgles, and their calls are dry chi or territorial chrrrrt.